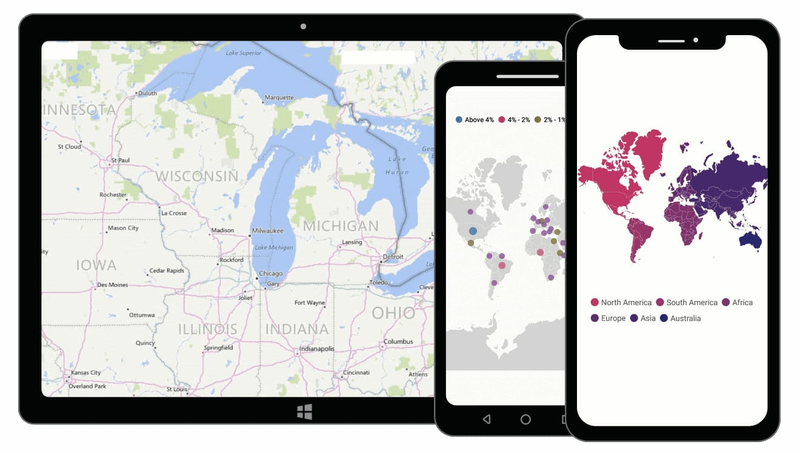 The Xamarin.Forms Maps control is a powerful data visualization component that displays statistical information for a geographical area. It has highly interactive and customizable features such as zooming, panning, selecting, legends, markers, bubbles, and color mapping. Using the maps control, you can render various maps, such as sales, political-boundary, weather, electoral, and route maps, and much more. Shape layers provide options to render geographical shapes or custom shapes on Xamarin.Forms Maps by binding shapefiles (.shp) or GeoJSON (.json) data. You can customize the default style of shapes and load multiple shape files in a single map view. Built-in support for external imagery services, such as Bing Maps and OpenStreetMap, is used to visualize satellite, aerial, street map, and other imagery tiles without using shapefiles. Apart from Bing maps and OpenStreetMap, you can also render maps from other map providers such as Google Maps and TomTom. Easily annotate maps shapes with labels to improve the readability of a particular shape’s name. You can customize the look and feel of default labels and align labels smartly within shape boundaries. Produce a heat map by customizing shape colors based on the underlying shape value by using Equal color mapping and Range color mapping support. Markers allow you to denote a place with symbols, like pins, or display a message at specific coordinates on Xamarin.Forms Maps. You can set the marker type to built-in shapes—such as circles, image, diamonds, rectangles and squares. Bubbles are used to add information to shapes, such as population density, land area, and more. They are rendered with various magnitudes and colors based on the underlying data values of the shapes. You can customize the bubbles size and its color. Legends provide valuable information for interpreting maps by using colors, shapes, or other identifiers based on data. You can customize legends position and its icon. Interactive features—such as selecting, drill-down, zooming, and panning —greatly enhance user experience.